The Australasian Railway Association (ARA) congratulates the New South Wales Government for delivering a robust rail infrastructure focused 2015-16 Budget, which delivers on many of ARA’s key policy priorities outlined prior to the election earlier this year and will help boost the efficiency and productivity of the state’s transport networks. Acting Chief Operating Officer of the ARA, Phil Allan said that through the ‘Rebuilding NSW’ fund the Baird Government should be able to deliver on critical rail projects including the much needed second harbour rail crossing. “Sydney Metro rail projects have received over $1 billion for this year, which will ensure construction continues, and ultimately provide Sydneysiders with a fully-automated rapid transit system adding benefits for commuters that have not yet been seen on any other urban rail network in the country,” said Mr Allan. “We also welcome the ongoing commitment to the city’s growing light rail network with $120 million in this year’s budget for the CBD line and $19 million to progress planning for the Western Sydney Light Rail line radiating from Parramatta. “Sydney is experiencing a resurgence with light rail, moving away from the construction of roads, and towards a more sustainable, efficient and safer mode of transport, which will transform the way people live and move around one of Australia’s fastest growing and busiest cities. Mr Allan stressed that whilst investment in passenger rail infrastructure and services in the bustling city of Sydney was a key component to solving the state’s transport challenges, so too was investment in the state’s regional and freight rail networks and services. “The ARA is also pleased to see the New South Wales Government’s continued investment in maintaining and upgrading the regional passenger and freight rail network with $104.8 million allocated this financial year to upgrade regional branch lines and continue developing strong, resilient and efficient rail supply chains for the State’s primary industries, such as agribusiness and mining,” Mr Allan continued. “Another boost for regional rail is the $94 million allocated to continue procurement of the next-generation intercity train fleet with a longer term plan to replace the ageing XPT fleet. 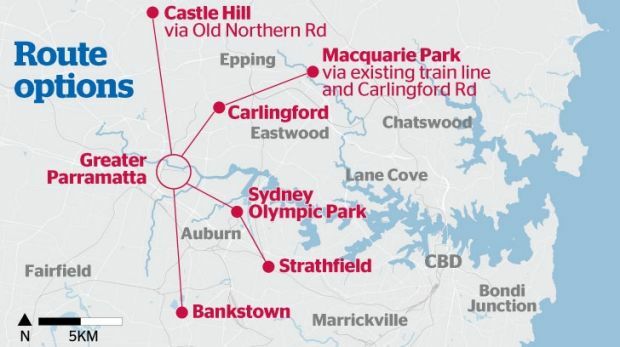 “In all, this Budget is forward thinking and focussed on delivering a robust rail network for New South Wales that will further enhance movements not only in the increasingly congested city of Sydney but will also extend to the growing regional areas. “The ARA congratulates Premier Baird, Treasurer Berejiklian and Minister Constance on this Budget and looks forward to working with the Government to ensure rail maintains its key role in New South Wales’ transport system,” concluded Mr Allan. The proposed routes for the Parramatta Light Rail.